San Diego Zoo offers such a vast assortment of amazing animals to spend your day enjoying, like frolicking giraffes to panda love. Be sure to get out early to see as much as you can or pace yourself, relax and savour watching your favourite animal for hours. And believe me, if the San Diego Zoo was my local zoo I’d get a pass and enjoy hours spent at many of their exhibits just taking it all in and really becoming familiar with each animal’s personality. 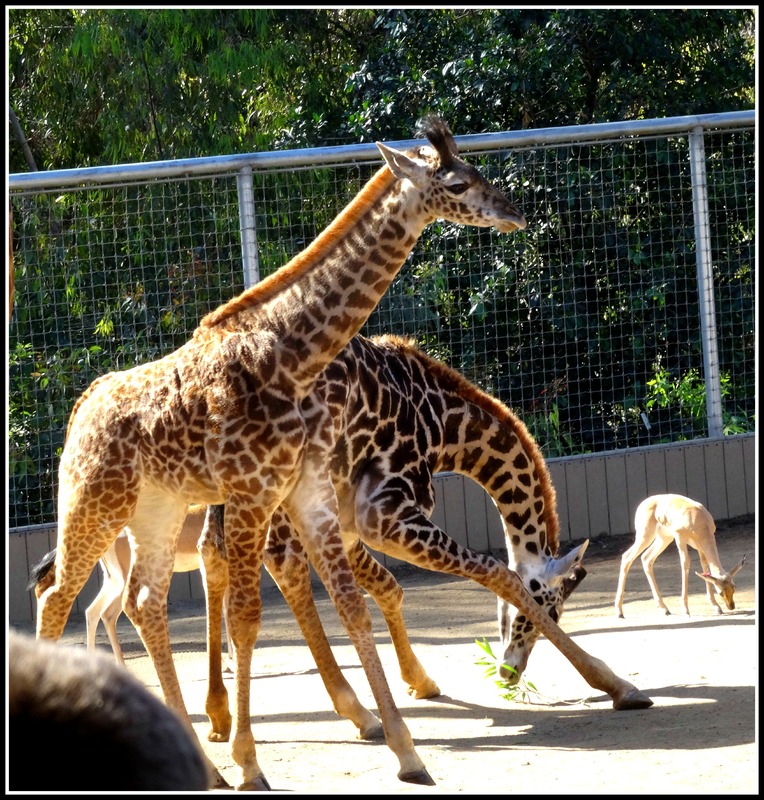 After the heat of the Outback I headed to San Diego Zoo’s Urban Jungle where I was thrilled to encounter some playful giraffes. Last year the zoo welcomed a big bouncing baby giraffe and then another one this year. It was so sweet to watch them romping around, gangly legs going this way and that, galloping after one another, young giraffes are too cute and humorous to watch with their awkwardly long legs. The Masai giraffes also share their exhibit with the elegant Soemmerring’s gazelles, I always enjoy an exhibit more when there are multiple species it looks and feels more natural. Who else will you find in the Urban Jungle? Here you’ll find pretty in pink flamingos, rumbling red river hogs and the regal greater one-horned rhino. There are two different routes you can take to get through the Asian Passage to the Panda Canyon from the Urban Jungle. The first is along Big Cat Trail, home to – you guessed it – some of the zoo’s cat species and mostly all are endangered. There’s the stunning Siberian lynx, the breath-taking beautiful clouded leopard which is one of my favourites, for its beauty, majesty and mystery. Clouded leopards are remarkable cats for many reasons like the fact that their canines are the same size as a tigers, though a tiger is ten times the size as a clouded leopard. The Big Cat Trail is also home to the cougar with a record breaking number of recognized names from puma to mountain lion and catamount to panther. It’s also here you’ll meet the zoo’s sensational snow leopards and a good opportunity to witness their master camouflage skills as they literally blend right in to the rocky background of their natural enclosure. 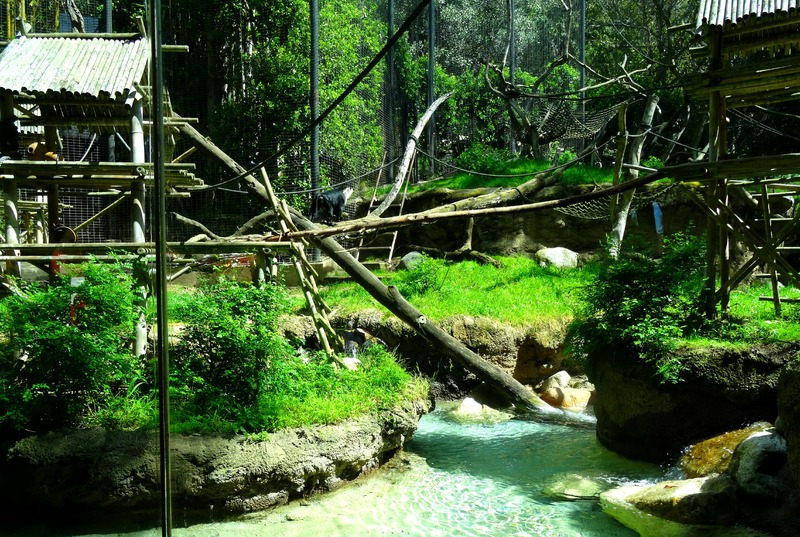 can you spot the macaque? The other route is up Center Street through Asian Passage home to hyenas, monkeys and bears. One bear species is the Malayan sun bear, the smallest bear in the world and named for the golden crescent on their chest, they are in my opinion the sweetest and most delicate looking of the bear species. Just past the sun bear you’ll find a troop of lion-tailed macaques. Named for the white/grey mane-like hair around their faces, these monkeys have quite the exciting enclosure, full of ropes, huts, logs over the water that runs around their islands oasis. I even caught sight of one doing a tight-rope walk across one of the logs. These macaques, like most primates, are very curious and clever and put their enclosure to the test on their first day out on exhibit by craftily reaching through wire mesh to redirect one of the sprinkler heads towards visitors. Panda Canyon is a hub of activity, all vying to see the San Diego’s precious pandas. But there is much more to see than just the pandas. Entering the gates into Panda Trek you find a trail that leads you by some remarkable species, like the red panda usually snuggled up in the tree tops. 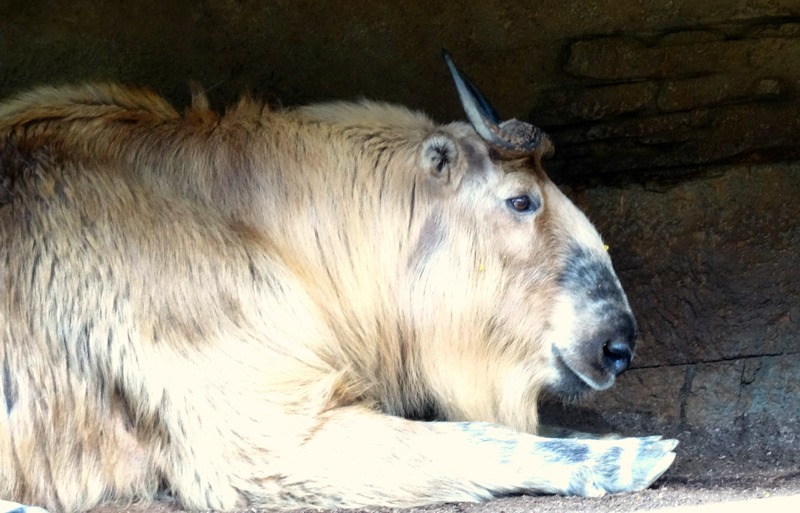 Then there’s the Sichuan takins, a large bearded, beautiful animal that also inhabits the same dense bamboo forests as the giant pandas, and are undoubtedly a creation out of a Dr. Seuss book. Also here is the handsome and rare Mangshan pit viper, of which the San Diego Zoo is working on breeding. Along the Panda Trek there are also several species of bamboo growing. Bamboo is a hardy material and grows fast, which is why it is a great resource and a better option for use in creating furniture as well as flooring instead of the traditional tree wood. You’ve made your way along the Panda Trek and have finally arrived at Panda Canyon’s stars – the giant pandas, Gao Gao (male), Bai Yun (female) and their cub Xiao Liwu (male born July 29, 2012). The San Diego Zoo is the most successful zoo in the United States in terms of panda reproduction. It was here that the first, in US history, two giant panda cubs were born and survived into adulthood, Hua Mei and Mei Sheng in 1999 and 2003. 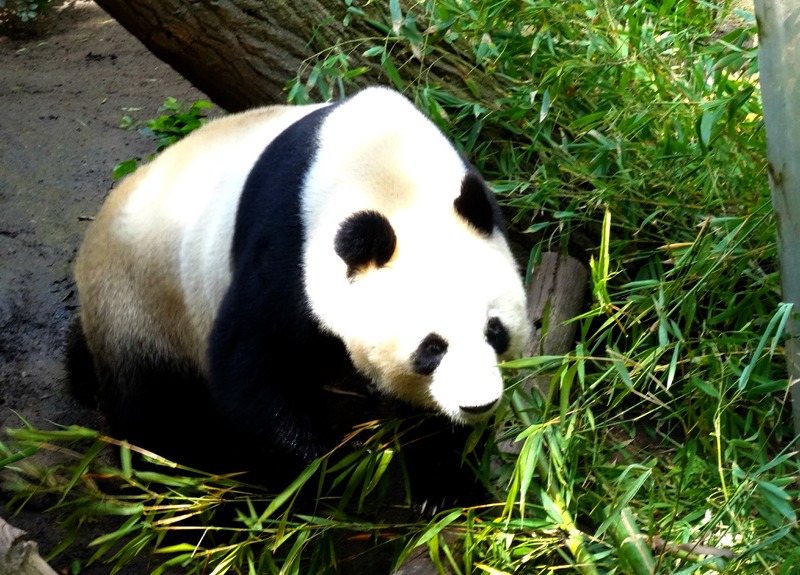 Bai Yun, since giving birth to these two, has had another four cubs, the latest Xiao Liwu turns 2-years-old in a few days and is said by keepers to be the smartest and fastest learner. On my visit it was nice to see the pandas lively and curiously sauntering around their exhibits. From frolicking giraffes to panda love, the San Diego Zoo is full of playful animals, interesting exhibits and much to learn. If you can’t make it there be sure to check out there website for animal cams, where you can watch the animals exploring, eating, sleeping or playing in their exhibits at the zoo from the comfort of your home. But I warn you it will only make you want to visit that much more! Check out San Diego Zoo’s Animal Web Cams here.